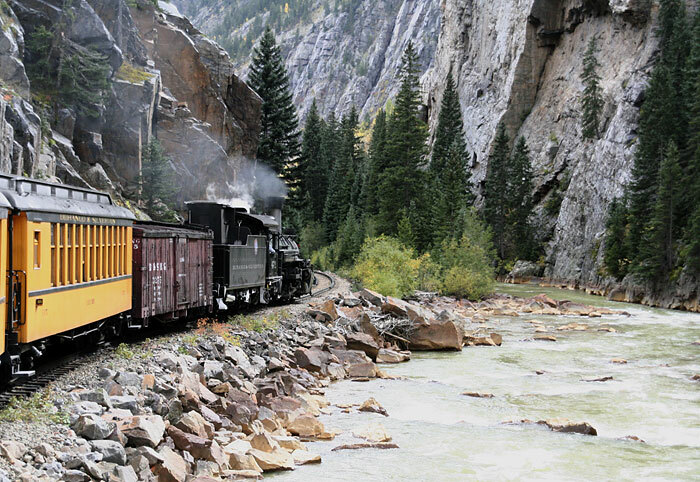 The 45 miles of track operated by the Durango & Silverton Narrow Gauge Railroad was built through the Animas River Gorge by the Denver & Rio Grande Railroad in 1881-82 as part of a wider Colorado network. After leaving Rockwood, some 18 miles north of Durango, 472 enters the High Line, blasted into the sheer rock face four hundred feet above the water below. 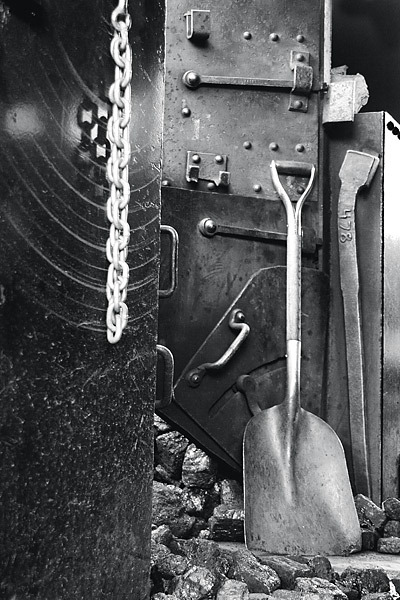 Cheaper to build and more suited to the terrain than standard gauge, the 36" narrow gauge tracks linked mountain mines and their communities to the outside world. 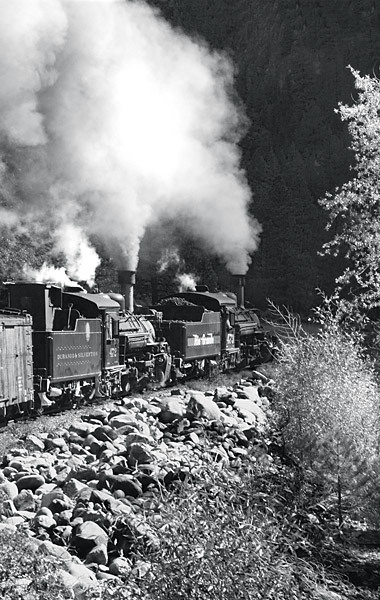 In 1888 it took four hours for the "Silverton Accommodation" to traverse the 45 miles from Durango to Silverton. The "Durango Mail" took eleven hours to cover the 200 miles from Denver. This remarkable engineering achievement was recognised by the American Society of Civil Engineers when they declared the line a National Historic Civil Engineering Landmark in 1968. It was designated a Registered National Historical Landmark by the National Parks Service in 1967. Some 23 miles out, northbound trains stop at Tank Creek to take on water. 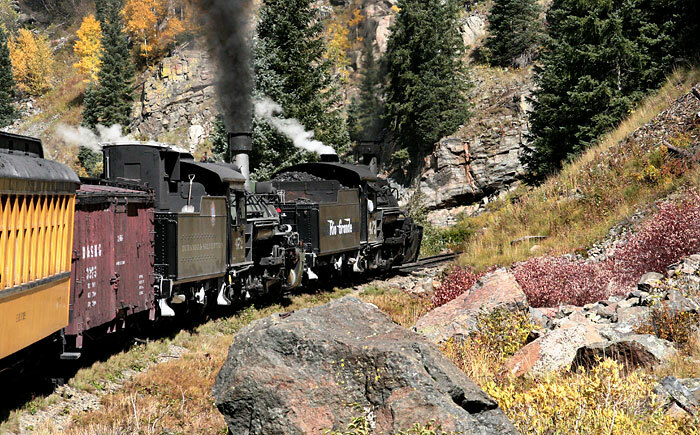 The locomotives consume considerable quantities of coal and water on the 2,768 feet climb from Durango to Silverton (elevation 9,288 feet). Here, helper locomotive 473 that detached at Rockwood, rejoined the train. 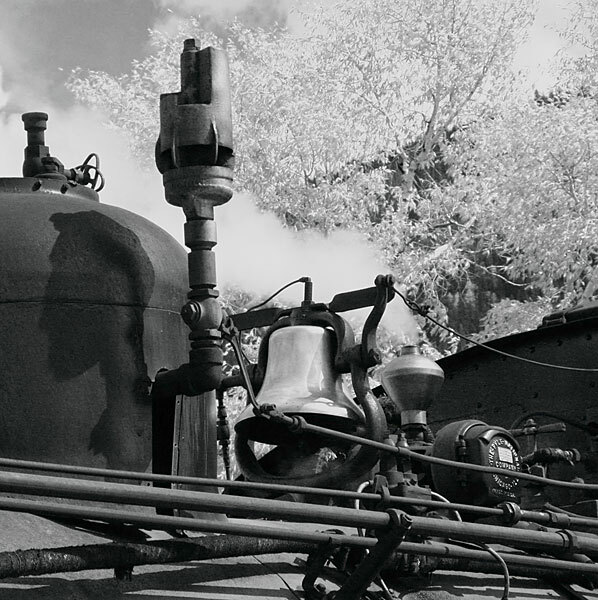 05 D&SNGR | Engine 473 at Silverton ".. but we have silver by the ton." Once the terminus of four railroads, Silverton was a supply base for many silver and gold mines. Three of the lines had closed by 1942 and the Silverton line itself faced closure in 1967. The American Locomotive Company (ALCO) built 473 in New York in 1923; its plough is essential in winter snow. As mining activity declined the Durango & Rio Grande Western found it financially difficult to operate the narrow gauge system. 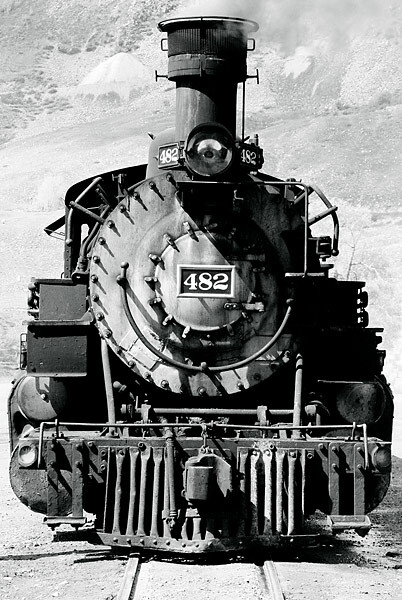 By the 1960s "The Silverton" was its only passenger train, surviving through tourist support. John Bradshaw Jr. bought the line in 1981, renamed it the Durango & Silverton Narrow Gauge Railroad and operated its first train on August 5 that year. 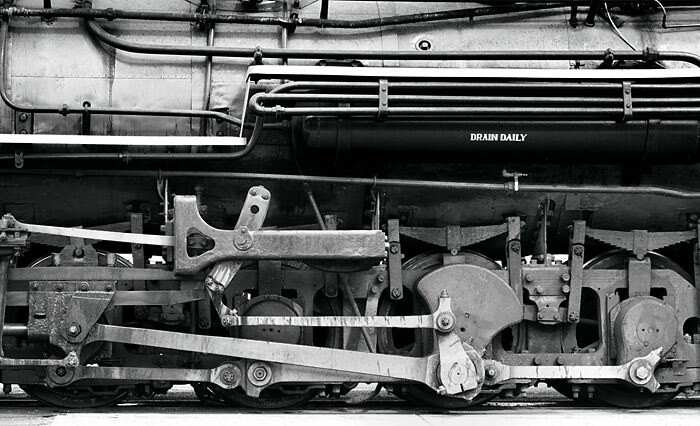 In 1925 the Baldwin Locomotive Works supplied ten class K36 engines to the D & RGW, of which 482 is one. Retired by the D & RGW in 1962, it was acquired by the Cumbres & Toltec Scenic Railroad in 1970 and transferred to the D & S NGRR in 1991. 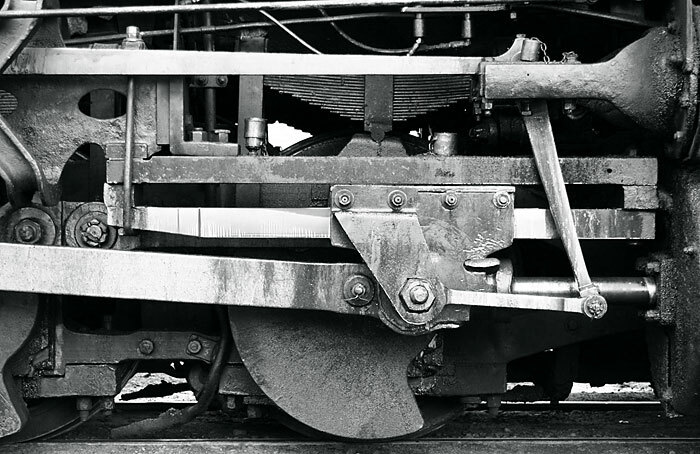 'Mikado' is the classification title given to a locomotive, such as 482, with a 2-8-2 wheel arrangement; a pair of pivoting guide wheels at the front, eight driving wheels and a further pair under the cab to help support the firebox. The name derives from a batch of locomotives built by Baldwin for Nihon Tetsudo (Japan Railways) in 1893. 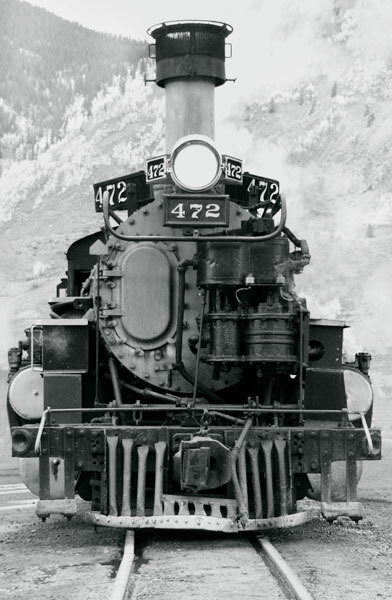 Said to be "the best and most powerful", the K36 locomotive class was only able to operate to Silverton after improvements were made to the right-of-way from 1981 to widen clearances and install heavier steel rails. More power hauled longer trains that generated greater revenues to fund operations and restoration. 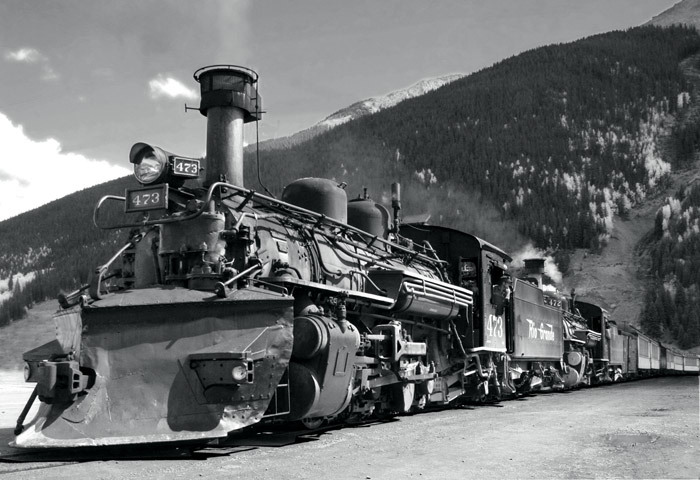 The only other section of the narrow gauge network to survive is between Chama, New Mexico, and Antonito, Colorado, bought in 1970 by the two State Governments, along with stations, locomotives and rolling stock. It is now leased to concessionaires who operate it as the Cumbres & Toltec Scenic Railroad during summer months. 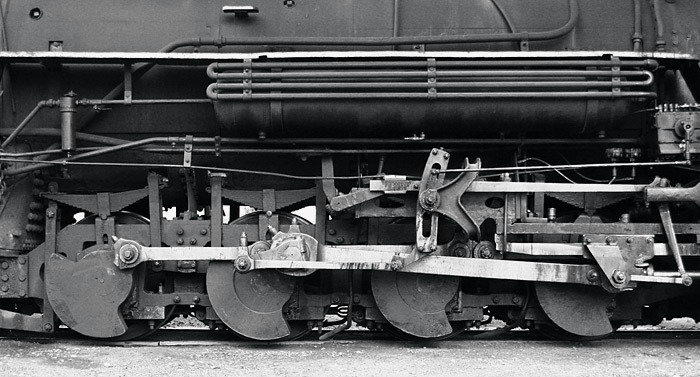 This view shows the fan-shaped counterweights fitted to the wheels to balance out the various rods and moving parts of the running gear, rather like smaller versions clipped on to road car wheels. The long cylinder above is part of the compressed air system that operates the brakes on all the passenger cars. Reducing the air pressure applies the brakes whilst increasing it releases them. Engine 482 awaits departure from Silverton against a backdrop of autumn aspen. 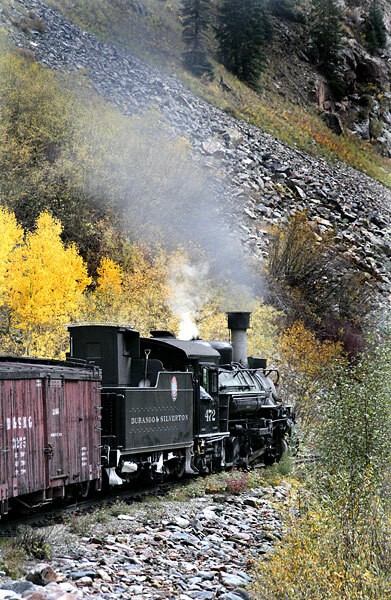 The Silverton Railway (1887-1922), the Silverton Northern Railroad (1895-1942), and the Silverton, Gladstone & Northerly Railroad (1899-1942), were all built out from Silverton to mines and settlements in these mountains. 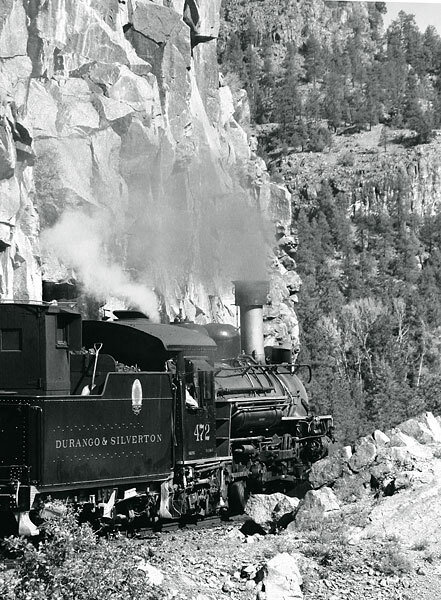 At Silverton, complete trains are "turned" on a triangular track "wye" ready for the return to Durango. Here, 472 stands under an intense afternoon sun after the engineer and fireman have completed checks, filled oil reservoirs, lubricated moving parts and wiped away some of the accumulated grime. The declining gradient on the return journey makes a second locomotive unnecessary. Locally mined coal fuels the locomotive fleet. Keeping the steam at optimum pressure takes both judgement and physical stamina from the fireman, especially on some heavy gradients on the outward run from Durango. 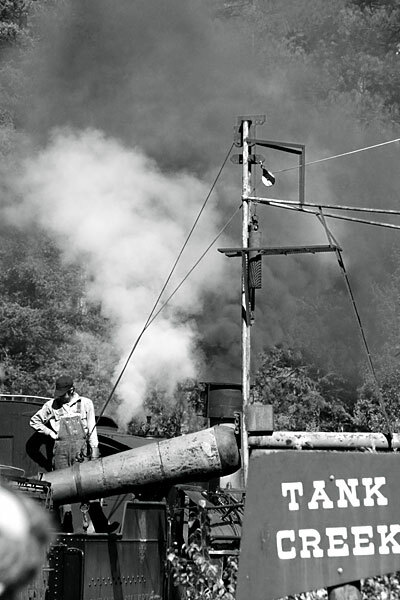 The quantity and distribution of coal in the firebox and regulation of the water supply to the boiler are vital to engine performance and timekeeping. 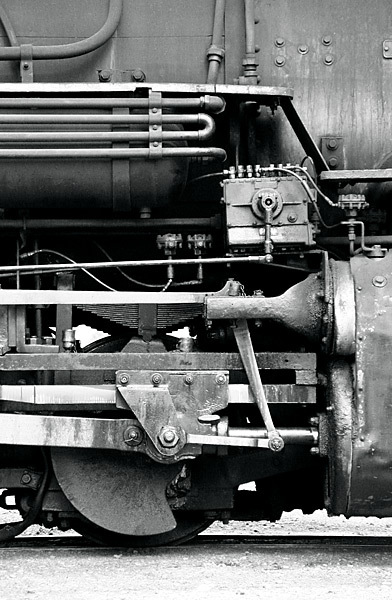 The American Locomotive Company delivered ten Class K28 locomotives (470-479) to the D & RGW in 1923. 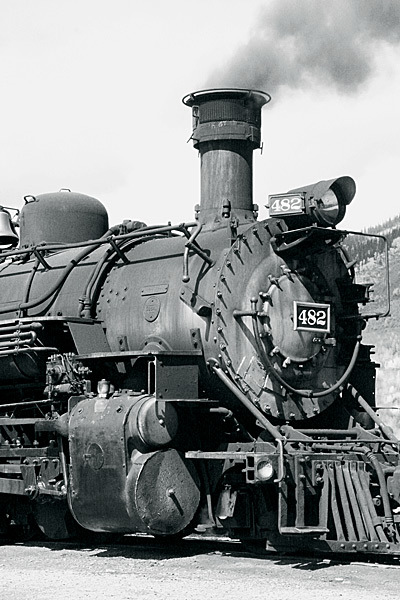 In 1943 the US Army Railroad Corps shipped seven of them, including 472, to Alaska. Hard use, climate degradation and poor maintenance made them unusable on their return in 1945 and they were scrapped. At the same time, 473, 476 and 478 continued to work on the D & RGW and are still in use on the D&SNGR. This photograph was taken in late September 2005 when 478 was temporarily renumbered as 472 for an earlier 'Fall Photographer's Special'. The Silverton station area provides open areas for photography and there is much to see in the town and its immediate surroundings. Silverton lies on relatively level ground surrounded by mountains. Here, the train is heading towards the entrance to the Animas Canyon where it will follow the river closely until the track leaves the High Line at Rockwood. Occasionally, snow-melt water washes out the track where it lies low and close to the water. The return journey requires less locomotive effort and is a little less spectacular visually than the outward from Durango. The train passes the few remains of timber-built structures of the Champion, Detroit and King mines high on the westerly rock slopes before entering this narrowest section in the Canyon. It takes three and a half hours to traverse the route through the San Juan National Forest wilderness. Travelling in a lively riding open gondola car, I used a hand-held camera and zoom lens to take the action photographs.